Podcast: Tea and remaining calm! Hoje eu falo sobre um aspecto cultural super relevante dos ingleses! Não perca. Hey, everybody. You’re listening to the new episode of the Inglês Online podcast, and today I’m talking about a cultural trait of English people. Today I’m going to tell you about something quite interesting – a cultural aspect of English people. So I dedicate this episode to all the listeners who are really curious about different cultures and, as for the rest of you… Keep listening ’cause there’s some good English here and you can never listen to too much good English. So check this out: like most of you, I own a smartphone, right? 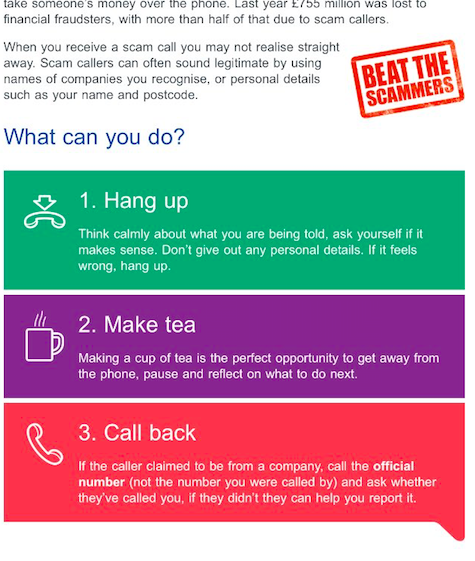 And guess what – we get scam calls here in the United Kingdom as well. I know… Shocker. Scam calls are basically made by dishonest people who would like to steal your money, so they will tell you a lie hoping that you’ll either give them money or disclose personal information that they will use to swindle you out of your hard-earned cash. First, hang up: Think calmly about what you are being told, ask yourself if it makes sense. Don’t give out any personal details. If it feels wrong, hang up. Then, call back: If the caller claimed to be from a company, call the official number (not the number you were called by) and ask whether they’ve called you. If they didn’t, they can help you report it. Good advice, right? I mean, hang up, then try to call the company to find out whether they have really tried to contact you or not… That’s sensible advice and it could have been offered by a responsible company from any country, really. But… that wasn’t all. I omitted step #2 on purpose, because that’s something only the English would say. Yes, there’s one more bit of advice between step #1, “Hang up and think calmly”, and step #3, “call the official number of the company”. Here’s step #2: Make tea: Making a cup of tea is the perfect opportunity to get away from the phone, pause and reflect on what to do next. Only then, after you’ve made tea and calmly reflected, do they recommend that you try and contact the company. I’ve talked a little bit about tea and British people – if you’ve read my post you now know I wasn’t exaggerating when I said tea is a very important matter in this country and is seriously woven into the fabric of British society. But there’s a reason why the company brought up “tea” in their advice – they’re telling their clients to reflect and think camly about what to do next. This is a very, very English way to behave. You guys, you have no idea how calm English people generally are at all times. Things that, communicated to the average Brazilian, would make them pull their hair out are met with a pensive look when relayed to an English person – that means they’re taking it in and trying to think about it rationally. Being rational, reacting calmly and not letting your emotions overtake you are traits that are highly valued by people out here. That’s why only in England would you see a step 2 like the one I got on this email – a step that combines tea and calm reflection in the face of a problem. That’s it for today – hope you’ve enjoyed today’s episode. Let me know either way and if you have your own ideas on how to react to scam callers – let me know in the comments and talk to you next time! ” do they recommend ” ? Esse “do” seria um auxiliar o verbo ? Veja a seção de gramática básica – Present Simple. Acabei de achar seu blog e seu podcast melhor descoberta do dia. Vou tentar ouvir todos os dias.